BlackBerry won't be killing BB7 anytime soon - which means those looking for advanced cheaper phones are out of luck. 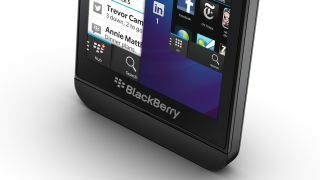 It seems odd that BlackBerry doesn't want to bring a cheaper phone running its 'phoenix' OS to the market as soon as possible, instead choosing to stagger it over time as it phases out, rather than kills, its older platform. Whether we'll see new Curve devices remains to be seen – but if so, it will send out a statement of intent to those that have recently bought BB7 devices that it isn't giving up on existing customers, which can only be a positive thing. These quotes form part of our in-depth interview with key members of the BlackBerry board – stay tuned to see the full piece coming soon.